The Sloughi temperament makes him a noble and dignified dog. His love for his owner is subtle but fierce – once he has chosen his “human” it takes a lot for that bond to be broken. In fact, this is the kind of dog that may only warm up to that one person in the family. If there is any trait that sums up this breed best, it is sensitivity. It is easy for someone not familiar with the breed to think the dog is snobbish. However, this is just the way he is – unless you're that one special person with whom he has forged a deep bond. He doesn't want you to touch him much, especially unexpectedly, as this startles him. He prefers to observe strangers from afar, remaining polite while protecting his personal space. He also does not enjoy excessive cuddling, so you should not have him around young children who have not yet learned how to appropriately handle a dog. If a young child handles him too much, he may withdraw and become despondent. He loves his family, but he is reserved, quiet, and elegant. If a member of the royal family transformed into a dog, it would be this one. As mentioned earlier, the Sloughi prefers to survey his surroundings from afar to keep an eye on things. And, because one unexpected touch can send him through the roof, you could say he's always on high alert. With its intelligence, grace, and overprotective nature, those who own Sloughis say the dog is more like a cat than a dog. When you picture a dog, you may picture a goofy but lovable canine who drools in your lap and wants you to throw the ball. When you picture a cat, you may picture a feline who, if she could, would smack her head in disgust at the dog. The Sloughi is more like the cat than the dog in this respect. It's almost as if he knows better than to act like an actual dog. He is also intelligent when it comes to training in that he can tell when you're getting frustrated. And if he knows you're frustrated, this can impact how well he listens to you. The Sloughi is one of those dogs that picks his “person,” and that's it. So, if you've ever found yourself jealous of your spouse because the dog loves him or her more than you, the Sloughi may not be for you. Experts believe that Sloughis originated in Ethiopia, while today they live more commonly in Algeria, Morocco, Libya, and Tunisia. 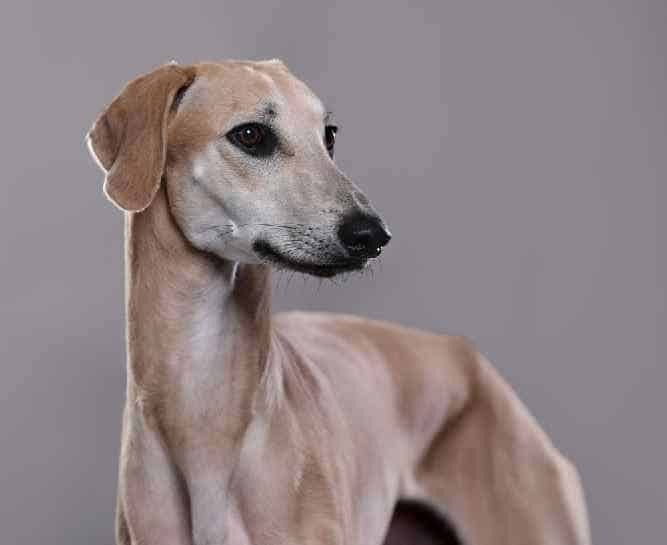 In 2008, DNA tests revealed the Sloughi to be a “genetically unique” sighthound. 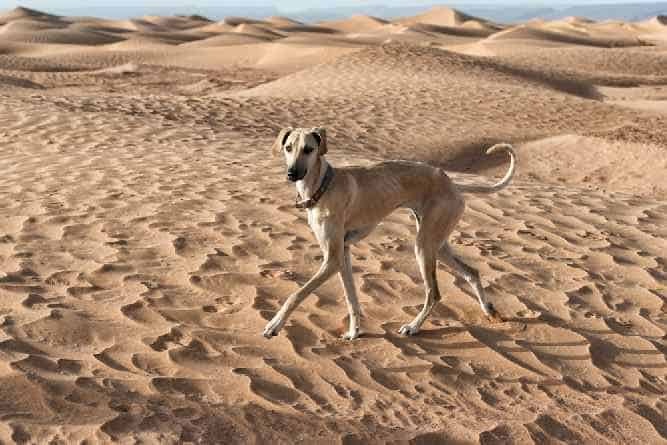 Those who search for “Sloughi vs Saluki” should not confuse the two, as the Saluki hails from the Middle East. Those native to the Sloughi's birthplace still use the dog for hunting and guarding purposes. 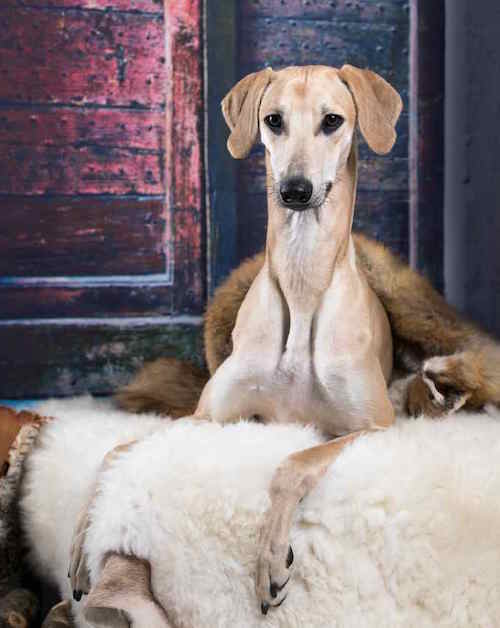 The Sloughi hound learns best from caring owners who are sensitive to his needs. Else, he can be a rather aloof dog. For instance, while some Sloughis are just shy by nature, others are more protective of their personal space. If you invade that personal space, for example, to spank the dog for misbehaving, he may develop trust issues going forward that become difficult to break. He does not respond well to harsh scolding, so focus more on positive reinforcement. He can also be stubborn, with a “what do I get out of it?” kind of mentality. This can be frustrating but remain persistent and consistent, and he'll eventually come around. If you are up for the fun and challenge of training your Sloughi then consult Doggy Dan's – The Online Dog Trainer for some great video training tips and tricks. As you may be able to tell just from looking at him, you don't have to do much to maintain a Sloughi's coat. A weekly brushing is sufficient to keep it looking smooth. Bathe him occasionally to keep him from getting that “dog smell,” and inspect and clean his ears regularly. You should also trim his nails regularly if he doesn't naturally wear them down. Untrimmed nails can be uncomfortable for the dog while walking. You may not be able to tell while he's home, but the Sloughi is a rather active breed. He's like a human that way: home is for relaxing, and the outdoors are for play. For this reason, you may be surprised to see the Sloughi speed around your yard when you open the door and let him out. And boy can he run! 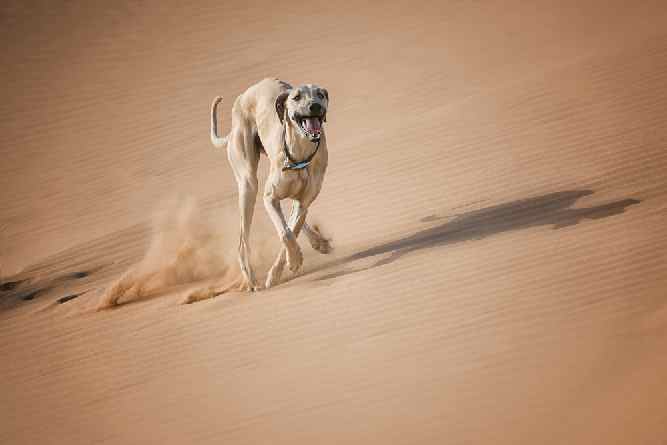 The speed at which this dog can run is something to truly marvel at. His agile body also helps him jump very high. For this reason, you must make sure that you have a high fence around your yard, and that you still supervise him while he's outside. So, if you've ever owned a Greyhound, then you'll know what to expect from the Sloughi. He also has a remarkable prey drive when he catches sight of potential prey. He'll hunt anything from cats to deer, even smaller dogs. The Sloughi's life expectancy is between 12 and 16 years. Important Note: Few things are more important than our Health. It's no different with our Dogs Health. Some visits (and Money) to your Vet can be avoided if only you know what to when your dog is ill. The Ultimate Guide to Dog Health is the answer. No dog owner should be without this handy guide. It's no substitute for your Vet but it will Save you Money and Heartache. This Dog Health Guide will help you quickly understand and recognize symptoms before they become a serious problem for your dog. Click Here to see if you agree. If you're considering adding a Sloughi puppy to your family, you're probably wondering just how to go about doing that. You can find a Sloughi for sale through a breeder who specializes in the breed, or by chance through a rescue or adoption agency. The average Sloughi price is around $1,500. Some Sloughi puppies can cost as much as $2,000. The price varies depending on the breeder. If you choose to adopt, then the cost is significantly lower. You may be able to find a Sloughi puppy available for adoption at your local animal shelter. If you don't find one on your first try, keep checking back. Unlike a specialized breeder, a shelter's stock changes all the time, depending on the types of dogs that they find or that people surrender. Some people prefer to adopt dogs, rather than buy them from breeders because older dogs know better than to behave badly. The shelter does its best to prepare dogs for living in a home with a family, so if the dog does not appear to have training, the shelter will attempt to train it. Anyone can find a breeder online, but how do you know that the breeder you choose is above-board? Generally, the best way to do this is to go through official sites, like the American Sloughi Association. You can generally trust that an organization wouldn't put their name behind someone who isn't reputable. The Sloughi temperament may be different from what you would expect from a dog. He is regal and calm, which can often come off as him being aloof – and he just might be. Those in-the-know have compared the Sloughi's mannerisms to those of a cat. You must take care not to startle him by touching him when he's off his guard. You must also be sure not to cuddle him too much, as this can make him uncomfortable. Imagine living with a member of the royal family, and you'll know what it's like to own a Sloughi. He lets himself go a bit when he's outside, getting his exercise. But once he uses up his extra energy and comes back inside, he returns to his reserved self as he cozies up on the sofa. Next post: Norwegian Lundehund Temperament (Loyal, Protective): Ready for the Challenge? Previous post: How to Unlock The Best Petit Basset Griffon Vendeen Temperament?